antioxidant compounds whose function is to prevent the proliferation of free radicals, protecting cells from damage and cellular aging. 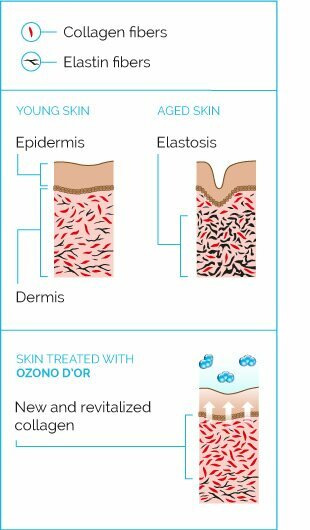 The OZONO D’OR Anti-wrinkle Day Cream is the best ally to eliminate wrinkles by stimulating the natural production of collagen, elastin and other protein molecules. It returns to the skin its lost elasticity, revitalizing it and restoring its ideal internal structure, slowing the appearance of wrinkles and spots on the face. Apply a thin layer on the face and extend circularly until it penetrates completely. You can repeat the process 2 to 3 times a day. Ingredients: Aqua, Ozonized Olea europaea oil, Cocos nucifera oil, Butyrospermum parkii, Cetearyl alcohol, Cetearyl glucoside, Glycerin, Vitis vinífera seed oil, Parfum, Cetyl ester wax, Lavanda officialis oil, Cymbopogon Martíni herb oil, Xanthan Gum.